There are days when all you want to do is stay home and do nothing. For me, bad weather is always a good excuse. What’s yours? There are some unusual words to describe a lazy day at home, a busy day at home, or when you’ve spent too much time at home. Which one best describes your situation? Fabio is a couch potato who refuses to move when football is on TV. nesting: Some people enjoy spending a lot of time in their homes to make them nice places to live. This is called nesting. Birds build nests out of sticks to hold their eggs and baby birds. Nests provide security for wildlife so people like the idea of nests too. The word nesting became popular more than twenty years ago. It describes people buying their first homes and filling them with many things. Pregnant women practice nesting to prepare for the birth of their baby. cabin fever: Too much time inside the house using a computer or watching television can cause someone to get cabin fever. A cabin is a simple house usually built far away from the city. People go to a cabin to relax and enjoy quiet time. Cabin fever is not a disease. 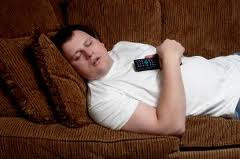 However, people can experience boredom and restlessness if they spend too much time inside their homes. This is especially true during the winter when it is too cold or snowy to do things outside. Federica suffered from cabin fever during the long winter.